When you arrive at the sleep center you will be greeted by one of the Polysomnographic Technologists or (Sleep Techs.). They will check you in and show you to your private room. After showing you the facilities at your disposal, they will explain to you what you can expect for your study night. If necessary, they will have you fill out and sign any paperwork that has not yet been completed. They will take and record your vital signs prior to the night’s study. Your technician is also responsible for preparing you physically for your study. Prior to your time to go to sleep, they will come to your room and attach electrodes to your body necessary for monitoring your sleep. These will monitor your heart, breathing, oxygen levels, leg movements, facial movements and brain waves. All of these are important in determining the factors that may be affecting your quality of sleep. Once you’re prepared for your study, your technician will assist you into bed. Soon it’s “lights out”. Your tech will then go to their station where they will monitor your sleep throughout the night. All the while that you are sleeping, they are monitoring your brain wave activity to determine your state of sleep. They also regularly mark your state of sleep as well as your breathing and any body motions throughout the night. If you should need assistance of any kind, to go to the restroom for instance, you can just call out to them from your bed. They will be able to hear you and respond. At the end of the night, they have a wealth of information for your doctor to review. They will report these findings and discuss their experience in the lab concerning your study. 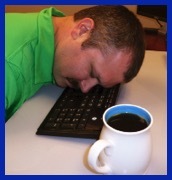 The doctor can then determine how well you are sleeping and what may be causing you to have problems with your sleep. For those interested in a career in sleep study, you may find some Sleep Technician job descriptions listed below. They are in .pdf format. Just click on the .pdf links below. You may also click on the Adobe Reader button to download Acrobat Reader if you don't already have it. 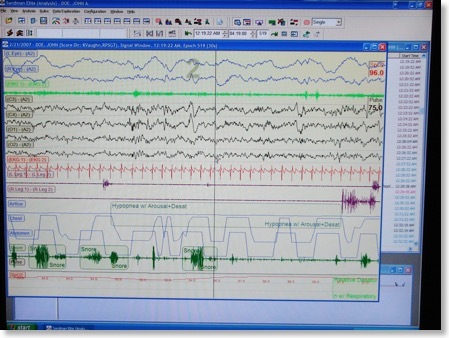 Image of a sleep record. Click to view full size.